One of the reasons that I changed the name of my blog was to have a forum for sharing not only my food/still life work and ideas but also my portrait photography work. I've been photographing more and more children/families and have had such a great experience sharing a moment with some wonderful clients. When you do portrait work, you really develop a relationship of sorts with your subjects (albeit a very short one). There's the hours involved in the sitting where you have an opportunity to talk to and get to know them, and then so many hours involved in processing the images and turning them into family memories and display pieces. I love that the moments captured become a documented part of a family's history. It's rewarding to be able to provide something so important to them. From my experience, the people who spend the time and money to capture and memoralize these moments are truly lovely people. 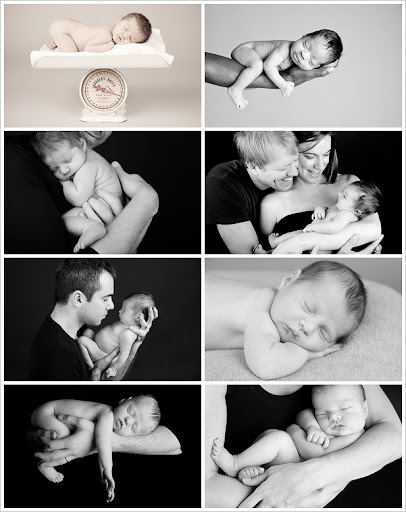 I thought I'd share a few of my favorite newborn images from this year. There are so many - it's hard to whittle them down to just a few. I have been favoring black and whites lately. They are so quiet and peaceful - there is nothing to distract. If you are interested, more can be seen here. One very different aspect of my portrait business from my food/still life business is that I turn the images into final products, producing prints, albums, canvasses and other display pieces. I've really developed a point of view about how to display images in a way that you can really appreciate them. I'll share some learnings here soon. I recently went to the PDN photography expo at the Javitz center in NY - it was a huge expo of the different vendors of printing services available to professional photographers. I left with a lot of materials to comb through and a lot of new ideas. It is all very fun and exciting. Let me know what types of things you might be interested in - it will help me shape posts on this subject. These are so sweet. Had our niece and nephew over this morning, and they saw the beautiful photo from you over a year ago. They had a chance to see their own baby nephew whom they'd never met. Enchanting. Ready for another updated one to show off! Your work is so special. I love it. the baby on the scale if my favorite. So adorable.